RePub, Erasmus University Repository: Large differences in neonatal drug use between NICUs are common practice: time for consensus? 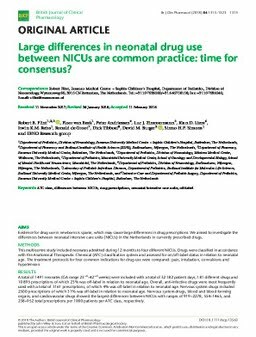 Large differences in neonatal drug use between NICUs are common practice: time for consensus? Aims: Evidence for drug use in newborns is sparse, which may cause large differences in drug prescriptions. We aimed to investigate the differences between neonatal intensive care units (NICUs) in the Netherlands in currently prescribed drugs. Methods: This multicentre study included neonates admitted during 12 months to four different NICUs. Drugs were classified in accordance with the Anatomical Therapeutic Chemical (ATC) classification system and assessed for on/off-label status in relation to neonatal age. The treatment protocols for four common indications for drug use were compared: pain, intubation, convulsions and hypotension. Results: A total of 1491 neonates (GA range 23+6–42+2 weeks) were included with a total of 32 182 patient days, 181 different drugs and 10 895 prescriptions of which 23% was off-label in relation to neonatal age. Overall, anti-infective drugs were most frequently used with a total of 3161 prescriptions, of which 4% was off-label in relation to neonatal age. Nervous system drugs included 2500 prescriptions of which 31% was off-label in relation to neonatal age. Nervous system drugs, blood and blood forming organs, and cardiovascular drugs showed the largest differences between NICUs with ranges of 919–2278, 554–1465, and 238–952 total prescriptions per 1000 patients per ATC class, respectively. Conclusions: We showed that drug use varies widely in neonatal clinical practice. The drug classes with the highest proportion of off-label drugs in relation to neonatal age showed the largest differences between NICUs, i.e. cardiovascular and nervous system drugs. Drug research in neonates should receive high priority to guarantee safe and appropriate medicines and optimal treatment.